Natural Hat Trick Productions: Some Radio Ramblings . . Some Radio Ramblings . .
Not as much time listening to sports radio this week as I would have liked, but I have a few things I thought I'd chat about for a little bit. Lots of chatter on what a disaster the Kelly firing is for the NHL earlier in the week. During the afternoon hours I usually listen, it was like impending doom was going to fall on the NHL. And you know, I'll be honest. I didn't immediately think that, but with a league as seemingly fragile as ours, and let me think of a not to mean word - MORON - running it, it's hard to imagine anything is impossible. So I will just leave it as, I hope not. For the game we all love and for us in the states having seemingly no other option than the NHL, I hope not. For the record, XM204 had similar sentiments as well. Scott Laughlin suggested it would have been best to dismantle the Players Association entirely - get all the people out of there that may be too comfortable or too involved - and start from scratch. Honestly...maybe that isn't such a bad idea. A big topic, obviously, today, was the 12-year signing of Roberto Luongo. Now, I ask, has anyone learned yet? From Rick DiPietro's contract that he may never even play out. From Hossa's contract suddenly not looking so good in Chicago. I think any contract of that length, unless given to someone like Ovechkin, is nuts. I just do. And a goalie, there is even more of a risk to it. So much can change with a given team, and with the league on a whole. Heck, I hate the 7-year contracts the Rangers gave out. I don't want to be saddled with anyone for that long. Again, you make exceptions for the Crosby's and Ovechkin's but other than that...too long, just too damn long. Team1040 was making fun of Canucks GM Mike Gillis for referencing Luongo in the same sentence with Johnny Bauer and Dominik Hasek. Those wouldn't have been my first choices, but - you can read his quotes here. The rest of today's conversation was how Roberto Luongo differs from Trevor Linden or Marcus Naslund as Canucks Captain and how they the fans, the team, the ownership may be looking at Roberto as a savior of sorts. I think nothing but the highest of Trevor Linden. He was a fans player. A person truly devoted to the team, the city, and the people of British Columbia. He deserves every kind word he gets. They referenced this photo on air today; again, I didn't need to look it up. It is ingrained. Naslund, they said, was loved when he was scoring, and certainly not beloved when he wasn't. He kept himself separate from the fans, not showing much emotion either way. Sound familiar Rangers fans? I always liked the guy because he was respected for doing his job and being a good person and player in this league. It's not easy to play hockey in Vancouver. He was a quiet-type person, who had a few remarkable years, a few not so remarkable ones, but who always led as a professional, in my memory. And despite his only being in NY one season, that is how I viewed him coming in, and that is how I will choose to remember him. Roberto Luongo, they discussed, can be fickle at times - and they didn't mean on the ice. Sometimes he gives a lot, sometimes he closes off. Not at all untypical of a goalie. But when I think of Roberto Luongo, I think of a couple things. I think of a guy who was harassed for wanting to be with his wife when she was going through the end of a difficult pregnancy during the All-Star game a few years back, which I thought was a horrible thing for him to have to endure. And I think of a guy who was one of only two or three players that came to the locker room to speak to the media after they lost to Chicago in that game last spring (the Kane hat-trick game), and the guy who had to, subsequently, leave the room after he choked up in tears because he was so upset. I'll take a guy that cares that much any day. There may not be a perfect leader. Or a perfect player. A perfect captain. And we'd certainly be hard pressed to find a perfect person. But, I'd like to think that pinning all hopes on one player is not the only way. You can look to them to lead, to be the best player they can be, to make their teammates better, and to care. And I think all three of them did that or can do that in their own right, and in their own time. I do. I follow the Canucks when I can. I do wish them luck. 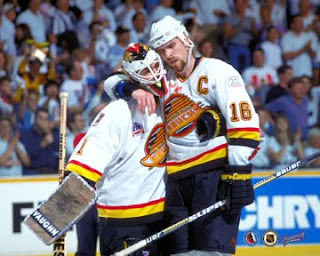 While I'd never take back 1994, a tiny part of me always felt for Trevor Linden being on the wrong side of that. I hope, someday, they can get there too. Monday had a lot of chatter and what Tony called "the best 10 minutes of radio [he's] had in a long time." They were talking Tom Cruise, Top Gun, reading, vocabulary, speeches, and whether or not PJ had gone to McKibbins (Irish Pub in la belle city for those of you not from MTL) before the show, as he kept screwing up John F Kennedy's "Country" speech. Apparently he bought a book of best American speeches and read that one the first night. And he had a really hard time saying "ask not what your country can do for you - ask what you can do for your country." I'm with Tony. That was fantastic radio. In hockey related topics, two things we can elaborate on here. I already posted on Twitter what PJ said: "Coaches are stuck with these players. Yes you want them to win, you want them to be successful...But you just don't have the talent to win." "I think everything falls on the GM"
Now, if you are a fan of the Rangers, you have got to be nodding your head. I said often enough last year that the Rangers, while not the utter train wreck that was the Canadiens, still paralleled that team a lot. Questionable decisions. Lacking passion from those supposed to lead the team. Questionable chemistry. The firing of a coach, but more questions for the GM. A lot was similar. So, I thought about PJs comment. And, despite knowing - absolutely knowing - that Glen Sather can be blamed for a great portion of the Rangers ills, he simply cannot be blamed for them all. He may have overspent unhealthy sums of money, over, and over, and over, and over again, on bringing in older, suckier, crappier, lazier crops of past-their-prime or never-had-a-prime athletes, yes. And he might have done this without ever standing up for his decisions, or showing his face in public, prompting thoughts that he, much like a Meyer-esque vampire, could not go out on sunny days - or, well, frankly, on any types of days, yes. And he might be still clinging desparately onto a status he gained by building a team of nothing out in Edmonton, in the model of a team like the Winnipeg Jets of the one-time WHA, while instead in his time in NY seems to be modeling the team's success after another local team of the same name. *sigh* - where was I going with this again? The players themselves - and they know who they are - who refused to try, sometimes, seemingly at all to even be worth half of what they were being paid. Look. A new season is less than a month away. In fact one month tonight, the Rangers will open their season on the road. I will not spend tonight dwelling any more on the particulars than I already have. And lastly, to close, PJ speculated today on what had perhaps gone on in Ottawa. (The great mystery of them all!) He said that if you looked at Jason Spezza's wedding party - which we did, back when photos were first posted - you'd notice two familiar faces. Former Senators Ray Emery and Brian McGrattan stood up for their one time teammate. Now PJ speculated that these might not have been the guys Ottawa would have deemed the most harmless, let's say. (That's my word, not his). But he said, perhaps, Spezza being young and impressionable, started hanging with particular company and got away from being focused on the game. Split groups. Tension arose in the lockerroom. Perhaps a divide among all the top players that we never knew for sure about. Trust me, lots has been speculated about Ottawa, and whether Heatley talks or not, whether he moves teams or not, I'll always be curious. Curious how a team that went to the Final led by Ray Emery in 2007 and started the following year so hot, could fall from grace so horrifically by the end. And not only not recover, but fall further in such speculation of some greater evil than just bad ice hockey. Isn't PJ Stock so cool? :-o Scandal in Ottawa? Could someone write a book on this? Oh, better yet, make it a movie? I'd so go see that. The Emery/Heatley/Spezza drama... that'd be so hot. We'd have to put in an affair though and make it really spicy. I see a blockbuster. But there really has to be more to the story. The team when from the finals to terrible, and Heatley sounds like a moron every time he talks because his justifications make no sense... unless there's more going on that he just won't say. Shan - PJ Stock is indeed "so cool." I'm a big fan! I hear some ppl from MTL think he is overplayed there, but with only the radio and one night of TV guaranteed a week, I am happy to see his goofy grin. Kerri - oh, yes, I agree - there is wayyyy much more than we'll probably ever know. Unless fast forward 30 years and someone writes a tell-all. It doesn't make sense. And I always liked Heatley, but just has not made himself look good in this, so it makes you curious. And I do! I really wonder how that all played out. And of course sincerely hope it wasn't as bad as some ppl are making it seem. A month till the hockey starts, a week till the NFL starts, Cal Bears football starts this weekend. It's so nice to bask in the glow of the sports seasons upcoming, no? Everyone is in first place. Anything can happen. Looking forward to chatting with you guys during the season! 2009-2010 Eastern Conference Predictions. . .
2009-2010 Western Conference Predictions. . .
Why We Root For Theo Fleury and More. . .